Discussion in 'Console & PC Gaming' started by GTPNewsWire, Aug 10, 2018. This article was published by Andrew Evans (@Famine) on August 10th, 2018 in the Hardware category. PocketZeven and baldgye like this. Looks really nice! Already got a PS4 Pro though. Translucent blue plastic & copper! That's a really ugly colour combo imho. It is a matter of personal taste I guess, but I think it looks great. 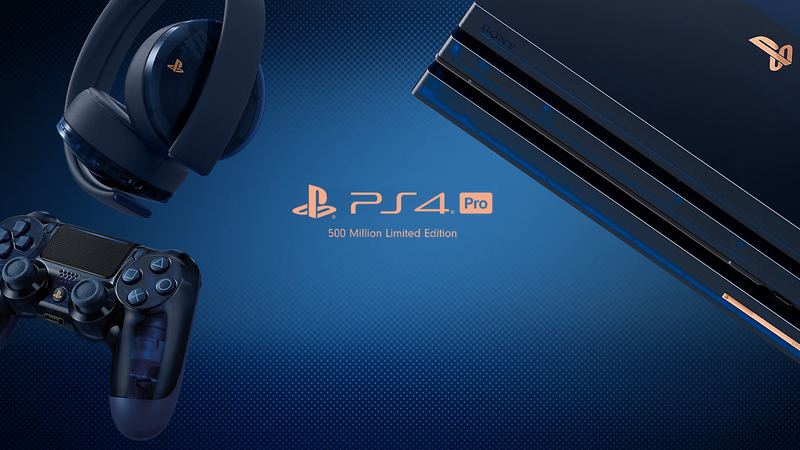 I am thinking of getting that controller as I already have a PS4 Pro and platinum headphones. MeanElf, xxy98cn, SiriusR and 7 others like this. If they've sold 500mil PlayStations (although I think it's more than that, at about 520mil), how many PS4s have been sold? how many PS4s have been sold? As of the beginning of August, 82.2 million. It should pass the PS3 (83.8m) some time around the end of the month. VXR and Fashiondevil like this. It's amazing how successful Sony have been with the PlayStation, especially given how it almost never was and then just came together. One shall almost certainly be mine. I've been toying around with the idea of a dedicated static sim rig, and my existing 1TB PS4 Pro would form the playstation side of that, with the new PS4 special edition with it's 2TB HD being able hold all the other video games I would want. Quakebass, Fashiondevil, Alpha Cipher and 4 others like this. Until Sony allows the Pro to play games in ways that the the slim or original can't do - I'm thinking games that could be fully VR on the Pro, but aren't due to the fact that Sony won't allow that if it won't work on the original or slim - then there's little point in upgrading unless you have a 4K monitor/TV. Yeah a big ,,V, To all those who supported you over that half a billion sales, Because we will release a system that means more sales.. How about a 20% discount on PSS to all those who contributed!? P.S Why didn't they just release a PS Pro in the shape of a gold bar! davidt33 and PocketZeven like this. Think it looks pretty good but unfortunately it has to work with the ugly PS4 Pro's design as a basis Nice nod to the Fat PS3's black translucent casing but the uncontained light from the power bar is going to make it look odd in the dark. I don't know how easily available they will be to buy (anyone even know which retailers will carry it? ), if its going to be one of those gone in the first 5 seconds of going live then I might not bother. I am kinda interested in a console, was going to hold out for the next gen ones just around the corner but would be tempted by this if its not a Black Friday style killing people in the aisles affair! Also how are they spitting the 50,000? If you take all the territories the PS4 is sold it will mean each country gets like 1,000 which is hilarious. I'd rather have the ordinary one simply because this edition looks weird. Besides, consumer electronics eventually stop working and it's easier to cope with the loss when it's not something unique. that is less than 1 day of sales..
so they should be all gone in a day or two..
too bad they didn't hold off till the PS5 debuted, and created a 500,000 million special edition of the PS5. Then all of us who already Own a PS4 pro, would be motivated to buy the PS5. Let's see How many PS4 Pro Owners can we get to buy a 2nd one.. I'm not generally a fan of "special" editions of hardware, but considering the occasion, this is a pretty sleek piece. The bronze gives it a quality finish to the typical trope of translucent electronic devices. Also, it helps that LEDs are a staple as opposed to the 90's GameBoy design. If the price is the same or within reasonable, I wouldn't downright turn it down if I saw it. At the very least, it'd be nice to have when my old PS4 inevitably kicks the bucket at some point. Nice nod to the Fat PS3's black translucent casing but the uncontained light from the power bar is going to make it look odd in the dark. The PS3 was not translucent, it had a piano finish. One is see-through, the other is shiny but solid. Analogy: Window to a mirror. Pre-orders already sold out at many vendors here! witham and PocketZeven like this. Looks really nice. Wouldn't mind getting one. I'll take this one and trade my release day PS Pro. 2TB is what I need, do not want any external HDD. Quite like how it looks. Headset... I guess it's worse than my Platinum which I do not really like, ps headset v2.0 I liked more, because of comfort. You could just put a 2TB in your existing PS Pro. A 2TB HD is dirt cheap and it’s dead simple to do - no technical knowledge required. What a phenomenon the PS4 in particular has been. Having seen it first hand for myself, the games catalogue definitely stacks up. Agreed, the 20th anniversary edition is one of my favourite ever special editions for any system ever made. I have a replica skin for my Slim that kinda resembles it. Not perfect obviously, but I wasn't willing to sell several vital organs for a legit one! Deffo gonna get the new controller; I'm a huge fan of the special versions Sony are putting out for the PS4. Already have the PS1 style and GT Sport versions. Everyone I've talked to about this special edition already has some kind of excuse to justify buying at least a controller if they can get their hands on it. In other words, I expect these won't have a long shelf-life. It makes sense, but it's also kind of disappointing.